SAN JUAN, Puerto Rico -- Environmental officials and scientists warned Friday that Puerto Rico is dangerously vulnerable to the effects of global climate change and urged it to prepare by better-regulated coastal development, and perhaps even by building artificial reefs. The storm-caused floods and erosion that have always affected the U.S. Caribbean territory are expected to grow worse as temperatures and seas rise, perhaps by 22 inches (57 centimetres) by 2060, according to a U.S. Army Corps of Engineers study. 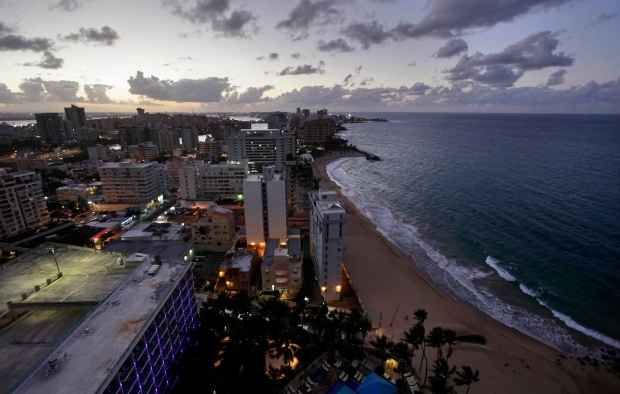 Nearly all of Puerto Rico's essential infrastructure is located on the coast, including the main international airport and all its thermoelectric plants, noted Carmen Guerrero, secretary of the island's natural resources department. A rainstorm in July forced temporary closure of the airport and claimed cars and houses elsewhere in the San Juan area. "We saw how the metropolitan area became paralyzed," Guerrero said during a conference on climate change sponsored by the government and independent environmental groups. "Our infrastructure could not handle that amount of water ... Puerto Rico needs to take action now, because otherwise, we're going to be dealing with crises." Natural coral reefs are not growing fast enough to keep up with rising sea levels, so the coasts are losing that natural protective barrier, said Ernesto Diaz, director of the island's coastal zone management program. So some are proposing creation of artificial reefs along popular beaches in Rincon, Ocean Park and Isla Verde that have been greatly eroded, Diaz said. Gov. Alejandro Garcia Padilla this year ordered local agencies to analyze the vulnerability of the public infrastructure and how to better protect it. The government also expects to create its first land-use plan and replace a 1886 Spanish law that still governs development along Puerto Rico's coast, which officials say has allowed construction along ecologically sensitive beaches. More than half of the island's 3.7 million people live along its nearly 800 miles (1,300 kilometres) of coastline, and the shore is a key draw for its multimillion-dollar tourism industry.